Proven to attract butterflies, even Monarchs! Got butterflies? 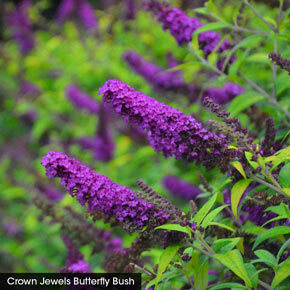 This trio of three reliable and colorful buddleia packs a lot of flower power into a very attractive value price. 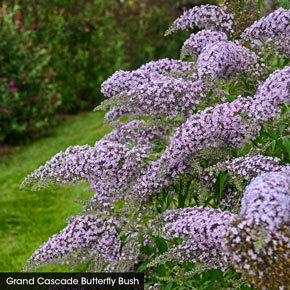 If you've been meaning to add more pollinator attractors to your landscape (because it's the right thing to do for the environment), and you want to maximize summer color, here's the solution. All three of these select buddleia present totally different flower colors, yet they'll blend well together when bloom times overlap. 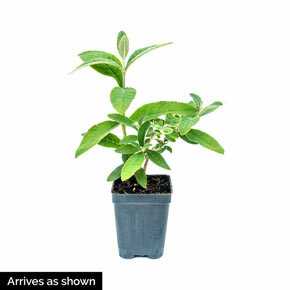 They also are all slightly fragrant and proven to attract hummingbirds as well. 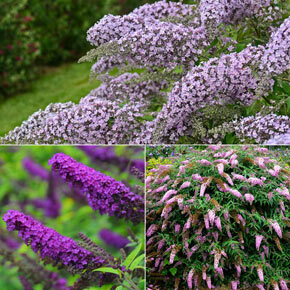 All are drought tolerant and while they grow as shrubs in the South, plants are best treated like perennials and pruned back hard each spring, to maintain a compact, bushy habit and best bloom count. 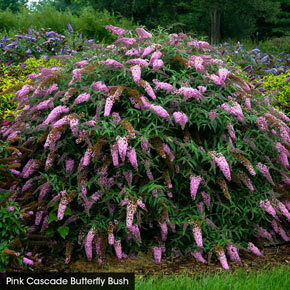 Trio contains one each of: BUDDLEIA 'Grand Cascade' PPAF, 'Crown Jewels' PP27878, 'Pink Cascade' PPAF. Total 3 plants. Watering Requirement: Low to average water needs.